When you feel healthy and vital and alive, you automatically drift towards things you love doing! Our super drink Kefir, the best probiotic in India, brought to you by KefirCo does just that! With regular consumption of kefir, your brain function improves. There have been plenty of studies that prove that your gut health is not only related to, but also responsible for your psychological and brain health. Go on, now! Grab a bottle! While it is 90 percent water, our star probiotic Kefir is one of the richest sources of healthy bacteria and fungi which not only play an important part in strengthening your immune system, but it is also loaded with nutrients. Kefir is an important source of minerals, electrolytes and vitamins. It also contains some protein, fat and sugar. Analysis by the United States, Department of Agriculture shows that a typical sample of kefir may contain more than 30 nutrients. Analysis of a 100gm sample of kefir: Water	90.07 grams Net carbohydrate	4.48 grams Total sugar	4.61 grams Protein	3.79 grams Total fat	0.93 grams Energy	41 kcal Minerals Calcium	130 mg Potassium	164 mg Phosphorus	105 mg Magnesium	12 mg Sodium	40 mg Zinc	0.46 mg Iron	0.04 mg Vitamins Vitamin C	0.2 mg Niacin	0.150 mg Riboflavin	0.135 mg Vitamin B-6	0.058 mg Thiamin	0.030 mg Vitamin E	0.02 mg Vitamin A (RAE)	171 µg Vitamin A (IU)	569 IU Folate	13 µg Vitamin B-12	0.29 µg Vitamin D	41 IU Vitamin D (2+3)	1.0 µg Vitamin K	0.1 µg Lipids Total saturated fatty acids	0.658 g Total monounsaturated fatty acids	0.310 g Total polyunsaturated fatty acids	0.053 g Total trans fatty acids	0.037 g Cholesterol	5 mg Source: USDA, National Nutrient Database for Standard Reference Need more reason? Gift your loved ones the best gift you ever could - the gift of good health. Get a subscription today! CONCERNED ABOUT BONE STRENGTH? The deteriorating bone diseases such as osteoporosis grow in systems that don’t get enough calcium, which is essential for bone health. Our super food kefir holds bioactive compounds that help absorb calcium into the body and stop bone degeneration. 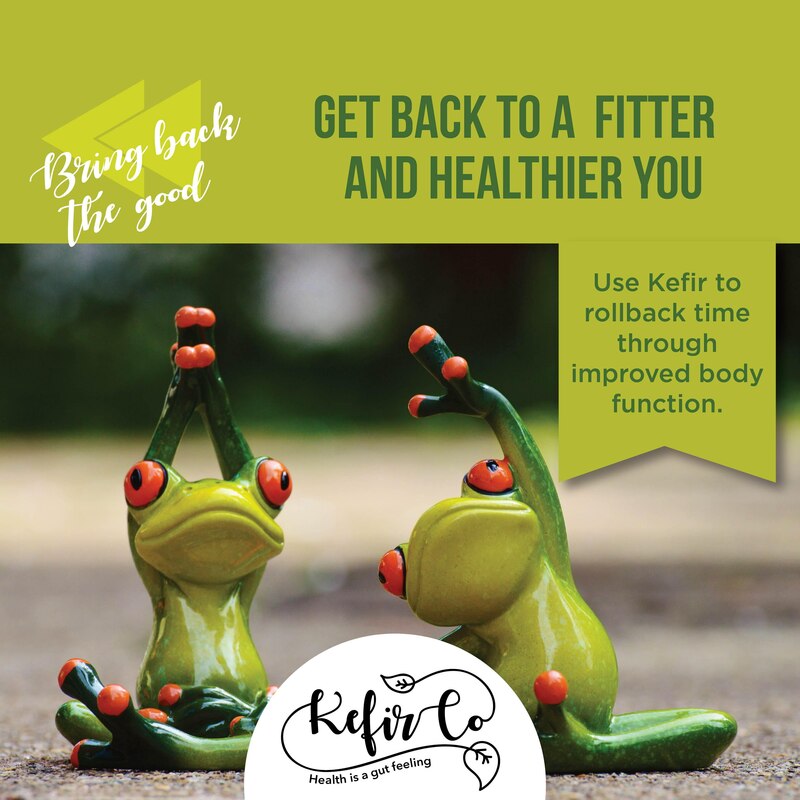 Kefir also contains vitamin K2, which has been shown to be vital in improving bone health, density and calcium absorption, while vitamin K deficiency can lead to bone issues. The probiotics in kefir improve nutrient absorption, the dairy itself contains all of the most important nutrients for improving bone density, including phosphorus, calcium, magnesium, vitamin D and vitamin K2. If you consume milk kefir, that contains high levels of calcium too. KefirCo brings you the most authentic and 100% pure kefir in India, made at home with kefir grains sourced from Europe. Order a sample today for just 100 rupees! We supply in Delhi NCR and Bangalore. Did you know?! Through the years, Kefir, our best probiotic, has been known as an effective health drink against tuberculosis, ulcer, arthritis, bronchitis, diarrhoea, and cancer, to name a few. Studies indicate that coconut water kefir is miraculous for kids who battle autism and slow brain development or other related issues.